The pope’s remarks came during a meeting at the Vatican April 9 with a group of bishops from the Armenian Catholic synod. The bishops were in Rome, together with numerous priests, religious and lay faithful, to take part in a liturgy April 12 that was to be concelebrated by Pope Francis and Armenian Catholic Patriarch Nerses Bedros XIX Tarmouni. April 24 will mark the commemoration of the 100th anniversary of the Armenian genocide. An estimated 1.5 million Armenians — more than half the Armenian population at the time — died in a forced evacuation from their traditional territory in the Ottoman-Turkish Empire from 1915 to 1918. Turkey rejects the accusation of genocide, saying the deaths were due largely to disease and famine. The Armenian genocide has not received universal recognition. Some governments, such as Belgium, France, Cyprus, Canada and Russia, have adopted resolutions affirming events, while others, including the United States, have not formally recognized the genocide. Papal speeches and the Vatican have not used the term “genocide” when referring to the tragedy. 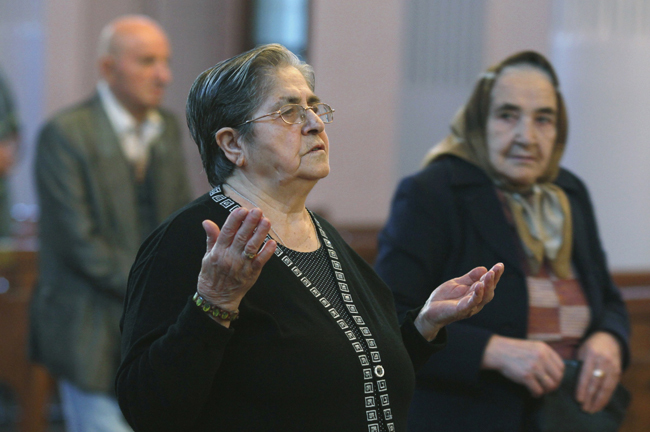 However, “for believers,” reflecting on the evil waged by humankind leads to “the mystery of the participation in the redemptive Passion” as many Armenians continued to proclaim their belief in Christ even to the point of “bloodshed or death caused by starvation in the interminable exodus they were forced into,” he said. He also noted “with sadness” how those who survived the forced expulsions 100 years ago flooded to neighboring regions, which today are seeing their Christian presence put into danger once again. The suffering of the Armenian people in a certain sense is an extension of Christ’s passion, he said, and as such gives way to the hope and joy of his resurrection. It is up to Armenian Catholic leaders to help the faithful “know how to read reality with new eyes” and be able to not just remember the past, but to draw from it new energy “to nourish the present with the joyous proclamation of the Gospel and with the witness of charity,” he said.